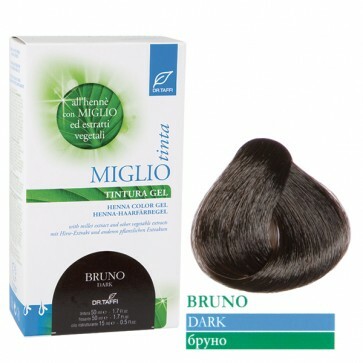 INCI: TINTURA IN GEL INGREDIENTI/INGREDIENTS: AQUA (WATER), COCAMIDE DEA, LAURETH-4, PROPYLENE GLYCOL, ALCOOL DENAT., ETHANOLAMINE, AQUA (WATER), GLYCERIN, LAWSONIA INERMIS (HENNA) FLOWER/FRUIT/LEAF EXTRACT, PANICUM MILIACEUM (MILLET) SEED EXTRACT, JUGLANS REGIA (WALNUT) SHELL EXTRACT, HAMAMELIS VIRGINIANA (WITCH HAZEL) LEAF EXTRACT, BETULA ALBA LEAF EXTRACT, CHAMOMILLA RECUTITA (MATRICARIA) FLOWER EXTRACT, VITIS VINIFERA (GRAPE) LEAF EXTRACT, VACCINIUM MYRTILLUS FRUIT EXTRACT, GLYCYRRHIZA GLABRA (LICORICE) ROOT EXTRACT, URTICA DIOICA (NETTLE) LEAF EXTRACT, FUCUS VESICULOSUS EXTRACT, AVENA SATIVA (OAT) KERNEL EXTRACT, DISODIUM EDTA, ASCORBIC ACID, SODIUM HYDROSULFITE. MAY CONTAIN +/-: p-PHENYLENEDIAMINE, TOLUENE-2,5 DIAMINE SULFATE, N,N-BIS-(2- HYDROXYETHYL)-p-PHENYLENEDIAMINE SULFATE, p-AMINOPHENOL, RESORCINOL, 2-METHYLRESORCINOL, 4-CHLORORESORCINOL, m-AMINOPHENOL, 1-NAPHTHOL, 2-AMINO-4-HYDROXYETHYLAMINOANISOLE SULFATE, 1,5-NAPHTHALENEDIOL, SODIUM PICRAMATE, 4-HYDROXYPROPYLAMINO-3-NITROPHENOL, 5-AMINO-6-CHLORO-o-CRESOL, BASIC YELLOW 87. FISSANTE INGREDIENTI/INGREDIENTS: AQUA (WATER), HYDROGEN PEROXIDE, STEARYL ALCOHOL, CETEARETH-50, CETEARYL ETHYLHEXANOATE, EDITRONIC ACID, OXYQUINOLINE SULPHATE, TETRASODIUM EDTA, PHOSPHORIC ACID, DISODIUM PYROSPHOSPHATE. TRATTAMENTO DOPOCOLORE INGREDIENTI/INGREDIENTS: AQUA (WATER), CETYL ALCOHOL, PEG-7 GLYCERYL COCOATE, CETEARYL ALCOHOL, CETRIMONIUM CHLORIDE, GLYCERIN, PANICUM MILIACEUM (MILLET) SEED EXTRACT, LAURYLDIMONIUM HYDROXYPROPYL HYDROLYZED WHEAT PROTEIN, PANTHENOL, CITRUS GRANDIS (GRAPEFRUIT) SEED EXTRACT,COPPER GLUCONATE, SILICA, PARFUM (FRAGRANCE), SODIUM BENZOATE, PHENOXYETHANOL, SODIUM DEHYDROACETATE, LACTIC ACID, GERANIOL, LINALOOL, AMYL CINNAMAL, BENZYL SALICYLATE, CINNAMYL ALCOHOL, HEXYL CINNAMAL, HYDROXYISOHEXYL 3-CYCLOHEXENE CARBOXALDEHYDE, EVERNIA FURFURACEA (TREEMOSS) EXTRACT, CITRONELLOL, HYDROXYCITRONELLAL. Descrizione: Tintura Gel all'Hennè, con estratto di miglio, henné, camomilla, mirtillo, avena, vite rossa, quercia marina, amamelide, liquirizia, mallo di noce, ortica, polline. TINTURA IN GEL INGREDIENTI/INGREDIENTS: AQUA (WATER), COCAMIDE DEA, LAURETH-4, PROPYLENE GLYCOL, ALCOOL DENAT., ETHANOLAMINE, AQUA (WATER), GLYCERIN, LAWSONIA INERMIS (HENNA) FLOWER/FRUIT/LEAF EXTRACT, PANICUM MILIACEUM (MILLET) SEED EXTRACT, JUGLANS REGIA (WALNUT) SHELL EXTRACT, HAMAMELIS VIRGINIANA (WITCH HAZEL) LEAF EXTRACT, BETULA ALBA LEAF EXTRACT, CHAMOMILLA RECUTITA (MATRICARIA) FLOWER EXTRACT, VITIS VINIFERA (GRAPE) LEAF EXTRACT, VACCINIUM MYRTILLUS FRUIT EXTRACT, GLYCYRRHIZA GLABRA (LICORICE) ROOT EXTRACT, URTICA DIOICA (NETTLE) LEAF EXTRACT, FUCUS VESICULOSUS EXTRACT, AVENA SATIVA (OAT) KERNEL EXTRACT, DISODIUM EDTA, ASCORBIC ACID, SODIUM HYDROSULFITE. MAY CONTAIN +/-: p-PHENYLENEDIAMINE, TOLUENE-2,5 DIAMINE SULFATE, N,N-BIS-(2- HYDROXYETHYL)-p-PHENYLENEDIAMINE SULFATE, p-AMINOPHENOL, RESORCINOL, 2-METHYLRESORCINOL, 4-CHLORORESORCINOL, m-AMINOPHENOL, 1-NAPHTHOL, 2-AMINO-4-HYDROXYETHYLAMINOANISOLE SULFATE, 1,5-NAPHTHALENEDIOL, SODIUM PICRAMATE, 4-HYDROXYPROPYLAMINO-3-NITROPHENOL, 5-AMINO-6-CHLORO-o-CRESOL, BASIC YELLOW 87. FISSANTE INGREDIENTI/INGREDIENTS: AQUA (WATER), HYDROGEN PEROXIDE, STEARYL ALCOHOL, CETEARETH-50, CETEARYL ETHYLHEXANOATE, EDITRONIC ACID, OXYQUINOLINE SULPHATE, TETRASODIUM EDTA, PHOSPHORIC ACID, DISODIUM PYROSPHOSPHATE. TRATTAMENTO DOPOCOLORE INGREDIENTI/INGREDIENTS: AQUA (WATER), CETYL ALCOHOL, PEG-7 GLYCERYL COCOATE, CETEARYL ALCOHOL, CETRIMONIUM CHLORIDE, GLYCERIN, PANICUM MILIACEUM (MILLET) SEED EXTRACT, LAURYLDIMONIUM HYDROXYPROPYL HYDROLYZED WHEAT PROTEIN, PANTHENOL, CITRUS GRANDIS (GRAPEFRUIT) SEED EXTRACT,COPPER GLUCONATE, SILICA, PARFUM (FRAGRANCE), SODIUM BENZOATE, PHENOXYETHANOL, SODIUM DEHYDROACETATE, LACTIC ACID, GERANIOL, LINALOOL, AMYL CINNAMAL, BENZYL SALICYLATE, CINNAMYL ALCOHOL, HEXYL CINNAMAL, HYDROXYISOHEXYL 3-CYCLOHEXENE CARBOXALDEHYDE, EVERNIA FURFURACEA (TREEMOSS) EXTRACT, CITRONELLOL, HYDROXYCITRONELLAL.